So Much Love and Friendship in the symbols. Apparently the initators of both the parties in Parti Ikatan Bangsa Malaysia (Ikatan) and Sarawak Workers Party (SWP) have something in common. The President of Ikatan is a Former information minister Tan Sri Abdul Kadir Sheikh Fadzir and the party was launched on June 7th 2012 while Dato Sng Chee Hua (former MP Julau,ADUN Pelagus and former Deputy President PRS) is the prime mover behind SWP and his son Larry was elected as President and the party was launched on May 28th 2012. Well,It will be the Malaysian General Elections soon. Stranger than normal things do happen during these times. Asks DCM Alfred Jabu and he will say..mushrooming only during…... Is it a Trend for the new parties ? So next time when one shakes a hand lets ask this question…Ready,Steady and Go…. 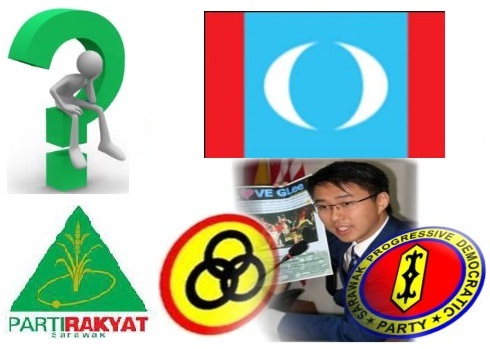 Are you Pakatan-Friendly,BN-Friendly or People-Friendly? We have often seen in the news about military personnels “killed in action by friendly fire” More often than not the enemy escapes unscathed and unhurt and live to fight another day. The intel given by forces on the ground did more damage than good. This GE13 Malaysia there will be, it seems “personnel fights within the BN” as far as Sarawak parliamentary seats are concerned. BN engaging with BN friendly will give extra “HOPE” for the Pakatan strategic team to work on. The Pakatan team will be looking from the high ground and they will concentrate on the spillovers of the fight within BN to further strengthen their cause. We can write a number of thesis and have it submitted but often have we not question the WHY its been done? There are obviously one thousand and 1 answers and you will have one answer already. We have heard too , the hearsays and the whatnots which spilled over at the carpets of the corridors of power. Many will not even leave their DEAR LIFE TO SAY THATS THE TRUTH. The point of matter is with regards to SWP(Sarawak workers Party) and GE5 (BN Club) remnants of former PRS and SPDP engaging head on not only with the BN4 coalition in Sarawak but 1BN Malaysia made up of other BN partners. GE5 says if their candidate is not nominated they will stay out and support BN. We were fortunate to sit down with PRS YB Alex Vincent (Ngemah) and SWP Protem Deputy Chairman YB George Lagong (Pelagus) and also PBB YB Len Talif (Belawai) at lunch during the recent DUN sitting. What was interesting was the question that was put to George Lagong? Surely, this will be a major talking point in the run up to the GE13 says a political observer who was also at the table. True enough, todays STAR news “let’s Tango,says Entulu” PRS deputy President was quoted” Come,face me in Selangau if you dare”he challenged Sng,the prime mover of SWP.He even said,”I will be sad if (Sng) doesn’t show up in Selangau as a candidate on nomination day. Entulu even welcomed the candidacyof Sng’s son Larry or daughter,if Sng senior felt that they couldbeat him in Selangau. Sng would not be drawn into a war of words against Entulu but said that they SWP will field a candidate against Entulu. What is friendly are the words which SPDP President has uttered which has caught the headlines. I’m sure you will agree with us these words are more BN tuned and in the spirit of a coalition which Taib and Najib would be praising the SPDP president. Spdp President Mawan said SPDP and PRS are friends and partners in BN,”We are not enemies.Our enemies are the opposition parties” He pointed out that the recent disagreement between Salang and Wong Judat was only personal differences and it was not fair to drag the party and accuse the whole party that it is against PRS in Julau. As much as BN thinks that this tactic would benefit the coalition the Pakatan knows already the tried and tested formula. BN wants to openly bring in and lure the fish to the net says a Pakatan spokesman but we are ready to challenge BN in all the 31 Parliamentary seats. They will not be one seat returned unopposed says the spokesman. The BN friendly fight doesn’t work anymore as we are ready to face headon Pakatan v BN. This was also to tell him that he was wise not to have taken the offer. We did not think it would have come to this. Furthermore after our telephone conversations we were even told that Sng Chee Hua would do an Asajaya replay in which 3 years ago he shouted “Hidup Taib three times” where we were present and heard with our own ears. This will make it certainly irate Masing and SWP would then be engaged in a friendly BN fight for the 6 seats. This will be seen as a win for PRS or SWP is a BN win and not a Pakatan win. SO WHO ELSE IS INVOLVED WITH SWP? 4 seats against PRS now turning to 6. The momentum gains support with huge numbers coming to the functions of SWP we were informed. A spokesman called audie61 and told us that SWP(Sarawak Workers Party) promoters George Lagong,Josephine Mawatand also former Sarawak Report journalists Lester Melanyi were together with Datuk Sng Chee Hua at the Parliamentary Seat of Selangau. The function at Ladang Empat in Selangau district was well attended by over 1000 supporters of SWP. At a nearby function the incumbent Selangau MP Joseph Entulu could only garner 400 people he said. Datuk Sng also handed a donation of $20000 to assist the longhouse JKKK and it is reliably learnt that he will take on the PRS No.2 man in Joseph Entulu. Meanwhile a PKR staunch supporter Baginda Minda and also former James Masings Information Chief said “VERY GOOD.Let BN fight BN- friendly and we will capitalise on the remaining voters.” Lubok Antu and Hulu Rajang are our top parliamentary targetted seats held by PRS. We also have candidates shortlisted . 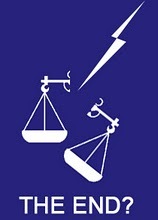 The imminent GE13 will see many aspiring politicians throwing their weight and names to be nominated to stand. Whatever political divide,ideals and party one stands on the “rakyat” will have the final say. CM Taib has already mentioned in Sarawak we practise democracy and the ‘rakyat’ will choose. Their votes will determine who will be the member of parliament for that constituency. The doors are slowly closing on Larry Sng as he fights for his political lifeline. According to our source the BN Supreme Council has put their foot down and has rejected “outright Larry’s application to stand as a direct BN candidate.It was unanimously agreed. It seems that there are only four options available for Larry. 1. He will have to stand as INDEPENDANT.If he wins joins any of the BN component parties like others before him. 2. He will need to join any other 2 other component party and hope that they FIND him a seat. PBB is a distant dream for Larry unless they make an “option” which is very unlikely. 3. Go back and “kowtow” to James Masing and PRS hoping he will be accepted back in the spirit of BN. 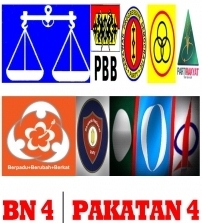 4.Leave BN and join Parti Keadilan Rakyat. An informed source even went as far as saying he does have a Fairy God-Mother who will make sure there is a seat available for him. It’s a decision Larry will need to make and as far as his political lifelife is concerned he himself knows bests. KUCHING: The political saga surrounding partyless Larry Sng has taken a new twist – he is not accepted as Barisan Nasional (BN) direct candidate to defend the Pelagus seat in the coming state election. According to an inside source, the decision was made during Friday’s BN Supreme Council meeting in Kuala Lumpur chaired by Prime Minister Datuk Seri Najib Tun Razak, and attended by all BN component parties. All leaders of the four state BN component parties were present during the meeting with Najib, including Chief Minister Pehin Sri Abdul Taib Mahmud, who is also state BN chairman. “The decision not to accept him (Sng) was unanimous and his case was not even debated by all the BN component parties,” said the source. Sng has been partyless since 2008 after he was sacked by Parti Rakyat Sarawak (PRS) for insubordination. BN Supreme Council Meeting has decided not to accept partyless Larry Sng as BN direct candidate. However, he is now holding three portfolios in the state cabinet – Assistant Minister in the Chief Minister’s Office, Assistant Minister of Youth Affairs and Training of Youth, and Assistant Industrial Development Minister (Training). Sng, however, could not be reached for comments yesterday. The 31-year-old, who made headlines in 2001 as the state’s youngest assemblyman, had said previously he would leave it to the BN top leadership to decide his political future. There were also speculations that he could be accepted into Sarawak United Peoples’ Party (SUPP) or Sarawak Progressive Democratic Party (SPDP) to be fielded in either Meradong or Meluan. However, both SUPP president Datuk Patinggi Tan Sri Dr George Chan and SPDP president Dato Sri William Mawan have downplayed such suggestions. OH No! What have we got ourselves into.?? A non deserved bashing by pro-BN supporters who acted as if their world just caved in. It was supposed to be a friendly gathering where liquor and good food was served. However when the drinks are consumed and the alcholic levels are way above the recommended limits by JPJ and Police breathalyzer test the undisputed TRUE words will just come out. The heading BN KangkoH means BN is in difficulty as Oil,vegetables and subsequently everything connected has risen up. The elderly folks who once voted for BN are now turning their backs against the BN administration not because they hate the BN but they feel that the YBs in the town areas are not fighting for their daily needs. If the medium income are complaining it means that the low income group will certainly vote for the opposition. Their argument is simple,”The BN YBs drive good cars plus very kilat( polished) with an air of show off and do you honestly think they really care for the rakyat(people). ?” One even pointed to a fact that a DAP assemblyman has gone round the houses of common people in his visitation and also join in with a little flutter of black jack. Do you see SUPP YBs do that..?? Its the little things which counts and if Najib says,People first,Performance Now is it being practised at grassroots level? Seriously,BN YBs needs to take a long hard look at the mirror and tell themselves they might just eat humble pie and be knocked out if they do not change their attitude. Their very own assured BN friendly supporters are beginning to take a long hard look at whether they will continue to vote for BN if prices keeps escalating. Najib knows that but can he really stop the unpleasantness of asking his assemblyman and MPs to tighten their belts and stop the lavish outlooks.Its easier said than done and how many of Najibs man can be seen at constituency coffeeshops ,eateries and local vegetable markets. Those who are reading this might say Yes we do,but many will shyly say Yes its only during the election periods only? We are not battering anyone but we must really look at why the people are complaining to such an extend now that it really looks bleak for the ruling government. If the BN government feels confident enough with all the SB ,Jasa,Rela,local agencies and Military intelligence reports and go with the flow just go ahead and call for the elections. See what would happen? Even a local based UMNO protem supporter said Sarawak will not have it easy and Najib if calling a general election now its “PURE CURTAINS DOWN ” for him. The recent byelections wins should not be taken in as the people are with BN.Its just not the indicator and really hard work needs to be done by Najib himself and his team before he calls for GE13.Dont be fooled into a short term excitement. Everything is going up and BN needs to really have a long hard look at the local consumer goods and products and ensure that the people are not blaming the government for all the PRICE HIKES. The businessman are going for profits a plenty at the expense of the government and if the government agencies are justs saying at ground zero level all is well Najib might as well give me a good kiss. It will happen and many are already sending signals to the top leaders but there is still the overzealous representatives who justs dont believe that they will be detroned and thus are keeping it away from the PM Najib. They too have their agendas. Reality hurts and if BN justs continue to feel all is well,Pakatan will capitalise and ensure that BN is history. As if we dont know.. The coming of age of the footsoldiers turned into Generals will be very influential in this battle of 2011 Sarawak State elections. 1987 and 1991 has come and gone and twenty years on the remnants of PBDS are now emerging out of their shells. They have been bruised,suppressed,humiliated and left to fend on their own.Some have even stayed under cover of the BN masters but they know now its time to strike back. Whats their argument? Nothing against Taib and his cronies personally but they know the time is ripe to come out fighting and gather back what is theirs and will not be pushed into submission. They have learnt without fuss what and how BN have used many methods and ways to stay in power. Now mosts of them are turning to a new Alliance and sees a new drift of fresh wind coming across from the Peninsular and images of People Power emerging also from the Middle East. Even warlords are coming out claiming that they will be financing 15 of their own candidates. The 15 seats won in 1987 by the now defunct PBDS is being used to draw encouragement and a new hope for a new government and new alliance. SNAP can claim 28 seats but a former BN strongman who has since left said by all accounts its 32 dayak majority areas. DAP will take on SUPP and is quietly confident of pushing their numbers up from the 6 assemblyman they have now to even doubling their numbers. Unless and if the SUPP leaders are still thinking that they are secured they will be in for a surprise. Did the Sibu episode teach SUPP a thing or two? Seriously, the opposition members in Sarawak have used the technological advances to their advantage and the Election Commission members are even caught off guard. The GPRS tracking bar code system is cleverly being used to even monitor any irregularities. Clever but many have underestimated their usefulness and many elderly politicians are still thinking they can find a way around these technology. God Help them if they keep thinking like that…! The groundwork is already being laid down and even the usage of tough, fearless and hard man are been met with the long elongated twin barrels of steel facing their faces. This time they are ready and will use what they have learnt to mobilise their own man not to be intimidated or fear whatever is brandished on them. DAP and SNAP are at bests working the minds and hearts of the people to accept them and turn it into votes and not false promises. In 1987 a dayak leader said,”We were left to rue what could have been and 1991 we suffered after a good showing. PKR will need to look closely at what they have and where they can deliver instead of being the “TAIKO” he said. Even the warlord he said does not particularly take him too kindly as he was very much branded an “Anti-Chinese” The brand of politics then mind you he described it was dayakism but we have moved on and sees it now that our people needs to vote their own as the assemblyman. Its a fight of different ideologies,party lines and who will win the hearts and mind of the people to turn to Votes. Is this wrong? He even used Liverpools resurgence to Kenny Dalglish who they think has the charisma to turn the team around.The supporters of Liverpool has suddenly found faith in the team and with the victory against multi-millionaires Chelsea at their home ground no one can be underestimated. Even Liverpool Manager for now said lets take each game as it comes along. Do you see it ..?? 15 seats we talk about we will and must deliver and the BN will not know what hit them. It’s a million dollar question and the greed and arrogance shown by Taibs closest family will eventually take Taib himself down and out of the equation. Even PRS and SPDP are looking over their shoulders and some PBB assemblyman looks confident outwardly but deep down they know they are in for a tough battle. They have looked after their people but by being virtue of being human beings they can change in an instant. The connected ones within BN are fearful that they will lose all if the modest 15 seats passed the simple majority of 36. The modest 15 seats looks easily achievable and with the mood of the people especially very unhappy with the ‘grabbing of land” Taib might do well if he clamps down and look at WHERE THE SPARKS will come from. Could it come from the Kapit dayak hinterland.?? The demise of PBDS many shed a tear or two but they moved on. The 15 seats mutiplied and added on will just easily surpassed the 42 grey areas which the SB has been indicating in their reports. BN must know that the downtrodden has woken up and paid heavily for their lessons and are ready to serve the peeople with a breadth of fresh air to take their places amongst the ruling government. BN needs to take steps to ensure that the people are still with them and they must not let everything to chance as it will mean a step nearer the end for them. The 71 BN candidates will face a challenge which will determine the fate of the BN government of Sarawak. They now will need eyes behind their backs and much more in meticulously looking at operational details with care and attention and briefed of the slightest movement in the opposition camp. The opposition knows the mood of the people is with them and a modest 15 seats is within reach. Did we not say the foot soldiers have gained tremendously..? ?Or Will they be extinguished even before the battle begins…. ?